Luçik Aprahämian’s versatility as a conductor places her equally at home in front of an orchestra, vocal ensemble, and the opera stage. With roots in the San Francisco Bay Area and Arizona, she has worked with groups of all ages and skill levels. 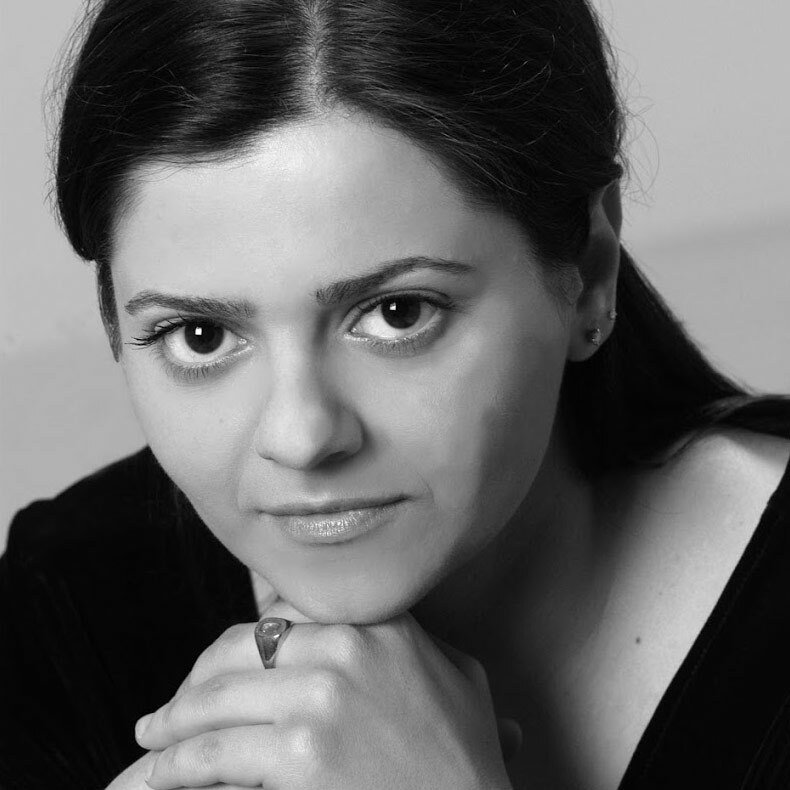 An avid exponent of new music, Dr. Aprahämian has commissioned and premiered works for a variety of performing forces. Premieres include composer Andrew Pascoe’s opera, God: The Opera; the U.S. premiere of the Costa Rican zarzuela, Toyupán; Hillary Connover’s The Six Swans; and David Evan Jones’s chamber opera, The Rehearsal. Commissions include Christopher Pratorius’ Variations on a Theme of Lou Harrison commissioned for the Cabrillo Festival of Contemporary Music Youth Orchestra, as well as his Cántigas de mi amigo Martín for the Women’s Chorus at The University of California at Santa Cruz. She is always thrilled to work on projects that bring new music to the community and most recently joined the stage with mezzo-soprano Robyn Rocklein in a performance of Jake Heggie’s Statuesque for mezzo-soprano and orchestra. Other work with orchestral groups includes resident guest conductor appearances with the Scottsdale Arts Orchestra in Arizona, as well as the Santa Cruz County Youth Symphony in California. Also in Santa Cruz, she was the director of the youth orchestra and student staff program for three seasons at the internationally renowned Cabrillo Festival of Contemporary Music led by Marin Alsop. Dr. Aprahämian greatest passion is for opera and she can be seen on the podium as well as backstage working with sets, props, and directing. Along with soprano Christi Amonson, she was the co-artistic director of Southern Arizona Opera, an organization that presents chamber versions of standard and contemporary operas. She has worked as assistant conductor and chorus-master for various professional opera companies in the Bay Area including Opera Parallèle and Bayshore Lyric Opera. She worked as the assistant conductor and director of the Opera Theatre Program at the University of California at Santa Cruz for over a decade on operas such as Don Giovanni, Street Scene, Le Nozze di Figaro, The Medium, Gianni Schicchi, L’Elisir d’amore, Carmen, and A Midsummer Night’s Dream. In addition, she has been the chorus-master for the University of Arizona Opera Theatre, and has been a conductor for the Opera Theatre Scenes. With an extensive background in vocal music and ensembles, she has emerged most notably as a leader in the arts community in Phoenix through her work with the Phoenix Women’s Chorus. Now in her fourth season as artistic director, Dr. Aprahämian’s vision for the choir has centered on collaboration, and being a leader in the community with a strong commitment to social justice. She has worked to expand the choral repertoire and has commissioned several works for the choir, including L Peter Deutsch’s Where Everything is Music for choir and saxophone; Deborah Dougherty Prayer of Music for choir and piano; and Dante De Silva — A Rejuvenated Heart for choir, flute, clarinet, violin, and cello, which was featured at the 2012 GALA Festival in Denver. As a collaborator on stage, she has worked renowned and up-and-coming musicians including concertmaster of the Phoenix Symphony Steven Moeckel, Arizona State University flute professor Dr. Elizabeth Buck, and Mana Saxophone Quartet member Michael Hernandez. One of the major accomplishments of her tenure with PWC is spearheading the “We Are One” concert, which brings together the various LGBT musical ensembles in Phoenix for a grand concert event. In addition, last season Dr. Aprahämian lead the name change of the choir from Arizona Women in Tune to Phoenix Women’s Chorus. This change has propelled the chorus into a new chapter in its twenty-two year history and has raised its visibility in the greater global community of LGBT choruses. Dr. Aprahämian is passionate about social justice and giving voice to underserved populations. The work that the choir does in this arena includes supporting and providing a platform to various charitable organizations in the Phoenix area, including women’s, children’s, and LGBT groups. Dr. Aprahämian has held various faculty positions in California and Arizona including at the University of California at Santa Cruz, Hartnell College, Arizona Academy for Arts and Academics, and BASIS Phoenix, where she currently teaches music and theatre production. She received her bachelor’s degree in fortepiano performance practice and master’s degree in conducting from the University of California at Santa Cruz, and her doctorate in conducting from the University of Arizona. She has studied conducting with Nicole Paiement, Bruce Chamberlain, Elizabeth Schauer, Thomas Cockrell, and Charles Bontrager.